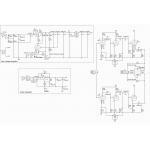 The circuit design is modified based on McIntosh and the design values are optimized. It uses three 12AX7 vacuum tubes for amplification and uses one pentode-triode vacuum tube 6F3P (6BM8) as voltage regulation. Vishay 1N5062 forming a bridge provide for full- wave rectification. The resulted ~300V DC. A low dropout regulator LM1084 is used to supply the filament. As all resistors and capacitors are low-noise with good channel matching, the sound quality should have low distortion. 1. Three vacuum tube 12AX7 for amplification and one 6F3P (6BM8) for regulation. 2. Design for WIMA / Solen AC coupling capacitors, Nichicon Audio capacitors, Philips / BHC Averox decoupling capacitors, and Dale resistors. 3. Built-in rectification and regulation circuit. 4. Dedicated power and ground rails for tube power and tube filaments. 5. 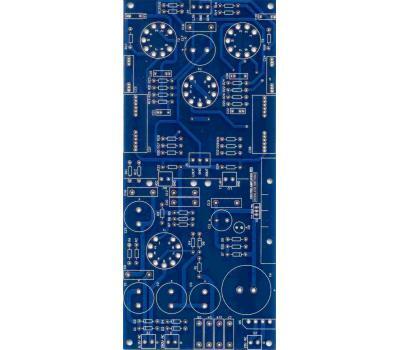 Symmetry in PCB layout design for both channels. 6. Power requirement: one 260-280V AC(50mA), one 12-18V AC (0.5A), and one 6.3V AC (1A). 7. 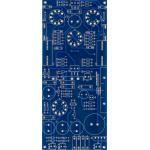 PCB dimension: 110mm x 250mm, thickness 2.5mm and 2oz copper, two layers.